By Shirley Copeland and Shirley Miller. Shirley Copeland is retired but worked 10 years with Indigenous people in Northern Ontario. She has also volunteered with Winnipeg Inner-City Missions. Shirley Miller, past president of South Western Ontario Synodical, is the Women’s Missionary Society Executive Council’s representative on the Justice Ministries Advisory Committee. 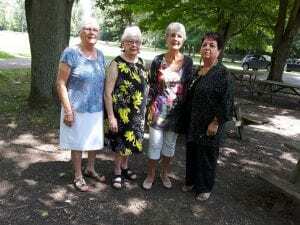 Left to right: Shirley Miller and Shirley Copeland (Paris PC) with Shirley Manning and Joan Martin from Grand River United Church, Six Nations. Some highlights included a visit to the First Native Women’s Firsts display at the Woodland Cultural Centre in Brantford, Ontario; the KAIROS Blanket Exercise with the Paris PC youth group facilitated by Katharine Sisk and Carragh Erhardt (Justice Ministries’ staff); and a special evening “Walking Together” with the Rev. Dr. Margaret Mullin and other guests from Winnipeg Inner-City Missions (WICM) who led a smudging ceremony and Sharing Circles. Margaret is the minister at Place of Hope Presbyterian Church in Winnipeg, Manitoba and the former executive director of WICM. The auxiliary president, Shirley Miller and secretary, Shirley Copeland are following in the healing process by attending Grandmothers’ Teas hosted by Nations Uniting, an outreach ministry of The United Church of Canada in Ohsweken, Ontario. The Grandmothers’ Teas are times of sharing and building bridges between Indigenous and non-Indigenous women. Meetings begin with a bountiful potluck lunch. Following lunch, a leader will explain the topic that everyone is invited to speak about. As we go around the circle only the person holding a special stone may speak. As each participant shares, it is obvious that our thoughts and experiences are very similar. We are certainly more alike than different, regardless of culture or heritage. There is such a tremendous need for dialogue between Indigenous and non-Indigenous people and we appreciate the opportunity to learn about life from members of Six Nations through these Grandmothers’ Tea gatherings.